Seven months after two bills were given to State Senate President Republican Roger Roth, they are now finally formally introduced. Senate rules stipulate that the Senate President is to “promptly” introduce bills given to him from senate authors. Introduction includes getting a bill number and a committee assignment, the first major steps in the legislative process. Nevertheless, the bills in question are now, at last, introduced. The bills deal with providing ethical guidelines for and promoting ethical material for fetal tissue research. Currently, some research at both public and private labs around the state utilizes fetal tissue derived from aborted children. This has caused ethical dilemmas for researchers who do not want to experiment on this type of tissue. It has also disturbed many members of the public who do not want to receive medicines and medical treatments that are derived from the unjust taking of human life. Background: The bill numbers are Senate Bill 423 and Senate Bill 424. Both bills have been assigned to the Senate Judiciary Committee. Yesterday, the Senate Republicans met in caucus to discuss these bills and several others as they begin to wind down their work for this legislative session. 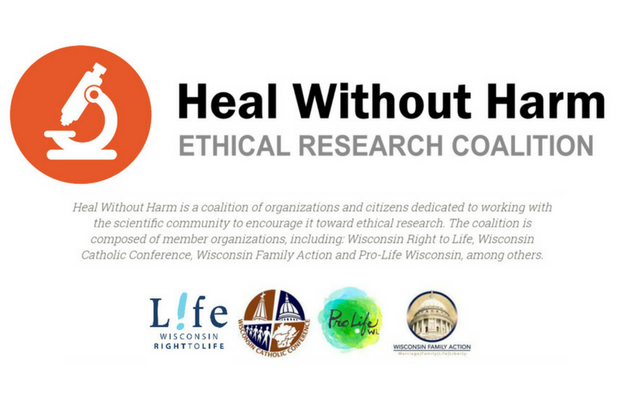 These two complementary bills comprise the Heal Without Harm Initiative. Senate Bill 423, known as the Fetal Remains Respect Act, outlaws the future exploitation of aborted children for fetal body parts, which are defined as tissue, organ or other part of an aborted unborn child. Senate Bill 424, known as the Unborn Child Disposition and Anatomical Gift Act, provides scientists with ethical sources of fetal tissue by making sure parents who experience a miscarriage or stillbirth at a health facility are aware that if they would like, they can donate their baby’s body for research. ***Wisconsin Family Action is urging citizens to call their senators ASAP and urge them to support these 2 pro-life bills. Click HERE to get information for your elected officials. Just put your address in the search bar at the top right of the page.